Govan D. White – co-founder and principal of Covenant Capital Group. He is responsible for managing the corporate activities of the firm, including finance, accounting, investor relations, transaction structuring and asset management. Govan is a member of the Investment Committee. Prior to forming Covenant Capital Group in 2001, Govan was a Managing Director with Solidus Company, from 2000 to 2001, where he formulated the investment strategy for the firm’s real estate activities in publicly traded REITs and direct investments in apartment communities. From 1995 to 2000, Govan was a Senior Vice President at AmSouth Bank and predecessor organizations where he was responsible for managing the mortgage portfolio, hedging interest rate risk, securitizing mortgages and selling mortgage servicing. He was a member of the bank’s Asset Liability Committee and Investment Committee. 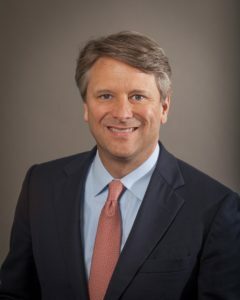 From 1989 to 1995, he was employed by Fannie Mae in Washington, D.C., where he was a Senior Business Analyst in the Single-family Division and worked on securitizations and corporate strategy initiatives. Prior to 1989, Govan worked in the securities industry as an investment advisor and trader. Govan has over 25 years of experience in the financial and real estate industries. Govan’s expertise includes all aspects of analysis, identification, evaluation and trading in real estate assets; he has managed the sale and securitization of assets worth over $3 billion in more than 150 transactions. He is a member of the National Multi Housing Council. Govan holds a Bachelor of Science in Finance from the University of Alabama (1984). Govan is active in the Greater Nashville community. He has served on several nonprofit boards including the Vestry of St. Georges Church, Volunteers of America Middle Tennessee and Rooftops. Currently, Govan serves on the non-profit governing boards of the Friends of Warner Parks and the St. George’s Endowment. Since 2016, Govan has been a member of the United Way of Metro Nashville’s Tocqueville Society Alpha Chapter, which is an alliance of community and business leaders addressing the needs of our community’s most vulnerable, and in 2018 was also appointed to the Campaign Cabinet of the United Way Community Campaign, which is focused on growing the nonprofit’s revenue to help families break the cycle of poverty.